This versatile PC case fan is designed to fit a broad range of computer case designs, to circulate cool air into the case, or exhaust warm air out - preventing problems due to overheating components. A quiet cooling solution, the near silent 8cm fan features a brushless ball bearing design coupled with a high-efficiency blade layout, capable of moving 37 CFM of air. 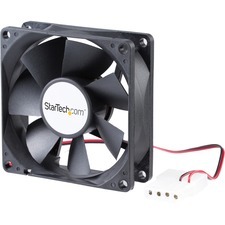 This broadly compatible PC cooling solution can be powered through a simple LP4 connection to the computer power supply.